To Cite: Ghafoori M, Azizian A, Pourrajabi Z, Vaseghi H. Sonographic Evaluation of Cervical Lymphadenopathy; Comparison of Metastatic and Reactive Lymph Nodes in Patients With Head and Neck Squamous Cell Carcinoma Using Gray Scale and Doppler Techniques, Iran J Radiol. 2015 ; 12(3):e11044. doi: 10.5812/iranjradiol.11044. Background: Cervical lymphadenopathy could be seen in several pathologic processes. An accurate differentiation between these conditions is of utmost importance to select an appropriate therapy and assess the prognosis. Gray scale and Doppler are appropriate sonographic techniques for evaluating internal and external features of lymph nodes. Although, various criteria have been proposed to differentiate metastatic lymph nodes from benign ones, the most valuable and specific sonographic features are still under dispute. Objectives: The present study was designed to determine valuable sonographic features for differentiating metastasis from benign nodes using gray scale and Doppler sonography. Patients and Methods: A prospective diagnostic study was performed on 63 patients with head and neck squamous cell carcinoma (SCC) treated and referred to surgery clinic of Hazrat Rasoul Akram hospital from November 2010 to June 2012 with complaint of palpable cervical lymph node. All patients’ necks were scanned multidirectionally by gray-scale and Doppler techniques. After sonography, lymph nodes were biopsied and investigated to find out whether they were metastatic or reactive. Finally, demographic, sonographic and pathologic data were statistically analyzed by SPSS ver. 16 software using t-test, a nonparametric test and ROC analysis. Ninety five percent confidence interval was considered for all parameters. Results: The study included 41 males and 22 females with a mean age of 57.56 ± 13.79 years. The number of metastatic lymph nodes was 47, while the remaining 16 were reactive. There were significant differences in length (P = 0.037), width (P = 0.001), resistance index (P < 0.001), pulsatility index (P < 0.001) and systolic velocity (P < 0.001) of metastatic and reactive lymph nodes. Cut points for resistive and pulsatility indexes and systolic velocity were calculated as 0.695, 1.35 and 16.5, respectively. The most valuable factor for defining a lymph node as metastatic was circulation pattern with accuracy, sensitivity and specificity of 94%, 85% and 93%, respectively. Conclusion: Gray scale sonography in combination with Doppler sonography could be a trustworthy technique in differentiating metastatic lymph nodes from reactive ones. Although, circulation pattern had a higher diagnostic accuracy in the present study, combination of sonographic characteristics could be more beneficial in differentiating metastatic cervical nodes from reactive ones. Approximately one third of body lymph nodes are placed in cervical region (1). Cervical lymphadenopathy could be seen in several pathologic processes such as lymphoma, tuberculosis and metastasis (2-4). Therefore, an accurate differentiation between these conditions is of utmost importance to select an appropriate therapy and assess the prognosis (5, 6). Five-year survival of patients with metastatic lymph node in one side of neck is 50% and presence of metastatic lymph nodes in both sides reduces the 5-year survival to 25% (7, 8). Several imaging modalities such as computed tomography, magnetic resonance imaging and ultrasonography have been used for evaluation of cervical lymph nodes (9). Although some studies reported ultrasonography as the most sensitive technique, some others reported no statistical difference between these modalities in evaluation of cervical lymph nodes (7, 10). Moreover, ultrasonography is a fast and relatively inexpensive modality and could determine small lymph nodes (< 55 mm) better than other techniques (10, 11). In addition, ultrasonography could assess both internal and external anatomy of cervical lymph nodes (11). Gray scale sonography is used for evaluation of number, size, shape and borders of lymph nodes (12-14). Pattern of intranodal vessels, blood flow velocity and vascular resistance are assessed by power Doppler sonography as well (15-18). Although, various criteria have been proposed to differentiate metastatic lymph nodes from benign ones, the most valuable and specific sonographic features are under dispute (19). 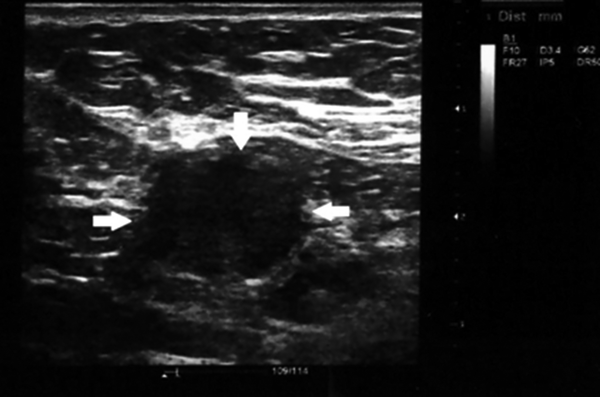 Because of mentioned factors, due to the importance of diagnosis of metastatic cervical lymph nodes diagnosis and appropriateness of sonography in evaluation of cervical lymph nodes, the present study was designed to determine valuable sonographic features for differentiating metastasis from benign nodes using gray scale and Doppler sonography. This was a prospective diagnostic study on patients with head and neck squamous cell carcinoma (SCC) who had been treated. All patients were referred to surgery clinic of Hazrat Rasoul Akram hospital (a tertiary center) from November 2010 to June 2012 with complaint of palpable cervical lymph node. 1- Surgery: whenever possible, oncology surgeons aimed to use minimally invasive surgical techniques to preserve patient’s function and appearance in the best way possible. 2- Radiation Therapy: in more extensive diseases, which restricted surgical excision resulting in incomplete resection or wide excisions causing severe morbidity. 3- Chemotherapy: a) Neoadjuvant chemotherapy (Chemotherapy only, given prior to radiation or surgery). Neoadjuvant (or induction) chemotherapy was given to patients before radiation or surgery. The aim was to reduce the size of tumor and decrease distant metastasis, to improve the success of additional treatments. b) Concurrent chemoradiation (chemotherapy and radiation simultaneously). This treatment is considered the standard care in the following circumstances: for localized SCCs, for patients who have had their cancer completely removed by surgery but at a high risk of recurrence of cancer, for patients with locally advanced to larynx and certain patients with cancers of the oropharynx (e.g. tonsil, tongue). 4 -Neck Dissection: Whenever possible, the involved lymph nodes were removed, sparing the sternocleidomastoid muscle, the spinal accessory nerve and the internal jugular vein. Treated patients were informed about routine follow-up visits and warned about alarm signs which should make them seek an out of schedule visit as soon as possible. The most insisted alarm sign was palpable neck mass, which probably represents neck adenopathy or recurrent tumor. All patients with palpable neck mass diagnosed and confirmed by a surgeon, traditionally underwent surgical excisional biopsy of the largest palpated mass and the excised tissue sample was sent for pathological examination to rule out malignancy. During the study, new patients with palpable neck mass were referred for neck ultrasound examination according to Helsinki protocol and with a signed consent to delineate sonographic characteristics of the mass found. Referred patients’ necks were scanned multidirectionally by Gray-scale and duplex techniques. Investigation of all cervical lymph nodes was performed by a single trained resident of radiology (whom his experience was confirmed by professors of radiology) and reviewed by an assistant professor of radiology. Commercially available Esaote Mylabe™ seven with a 5-MHz curved probe and a 7.5 - 10 MHz linear probe was used for evaluating the largest lymph node in patients. Sonographic evaluation was limited to the single largest palpated mass to avoid any additional confounding data and convenience of patient to avoid extra surgical biopsies. Data such as tumor length, width, appearance, circulation pattern and flow indices including resistive index (RI), pulsatility index (PI) and systolic velocity were gathered through sonographic studies. Studied variables were defined as follows; the maximal diameter was measured as the largest dimension for each node and minimal diameter was defined as the largest diameter perpendicular to the maximal diameter in the axial plane. The shape index was calculated as the ratio of the minimal to maximal diameter. Consequently, lymph nodes with shape indexes below 0.5 were considered oval, whereas lymph nodes with shape indexes more than 0.5 were defined as round (Figures 1 and 2). The resistance index defined as a measure of pulsatile blood flow that reflects the resistance to blood flow caused by microvascular bed distal to the site of measurement. Figure 2. A 68-year-old patient with treated lip SCC by chemoradiation. Patient presented with middle neck mass, which biopsy specimen proved metastatic involvement due to SCC relapse. A and B, Round shape cervical lymphadenopathy (solid arrows) with peripheral pattern in color doppler ultrasonography (thin arrows). A, Solid arrows indicate to the lymph nodes location and border to be distinguished from adjacent soft tissue. B, Thin arrows indicate to the peripherally located vasculatures as discussed in the text as a sign of metastatic lymph nodes. C, Histopathology image (100× magnification). The PI defined as the difference between the peak systolic and minimum diastolic velocities divided by the mean velocity during the cardiac cycle. The peak systolic velocity or systolic velocity defined as the maximum speed of blood flow in the arterial segment studied. The vascular pattern was defined as configuration and pattern of vascular branching of feeding arteries specified to every other organ, which include central, peripheral (Figures 2 and 3) and mixed patterns. Figure 3. A 71-year-old patient with laryngeal carcinoma treated with tumor resection and received adjuvant chemotherapy. Patient presented with lower neck mass, which biopsy specimen proved metastatic involvement due to SCC relapse. A, Cervical lymphadenopathy with peripheral vascular pattern in color doppler ultrasonography (arrows), thin arrows indicate to the peripherally located vasculatures as discussed in the text as a sign of metastatic lymph nodes. B, Histopathology image (400× magnification). The largest selected mass was easily palpated (minimum length and width of largest palpated masses were 22 mm and 11 mm); but under sonography guide, it was marked by cutaneous color marker to avoid any unwanted missing during surgical excision. Then, excisional biopsy of the marked mass was performed within seven days of sonography. All of the samples were investigated by a fourth year pathology resident and reviewed by an assistant professor of pathology to find out whether they were metastatic or reactive. Pathologists were blinded to the results of sonography. Finally, demographic, sonographic and pathologic data were statistically analyzed by SPSS ver. 16 software (SPSS Inc., Chicago, IL, USA). T-test, Fisher exact test and Kruskal-Wallis test were used to evaluate the significance of parameters collected from the two investigated groups. A 95% confidence interval (CI) was considered for all parameters. 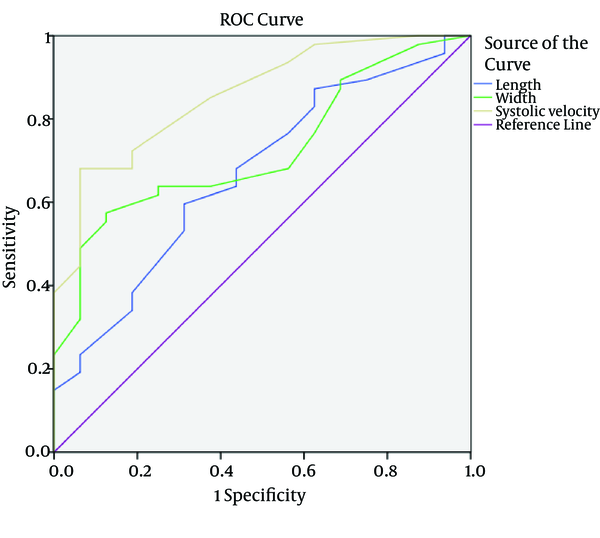 In addition, to distinguish different characteristics of lymph nodes, receiver operating characteristic (ROC) under the curve analysis was used to calculate the area under the curve (AUC) and sensitivity and specificity using discriminate thresholds (Figure 4). The study included 63 patients with head and neck SCC consisted of 41 males and 22 females. Mean age of patients was 57.56 ± 13.79 years ranging from 19 to 76 years. Mean age of patients with metastatic lymph nodes was 59.36 years and mean age of patients with reactive lymph nodes was 52.25 years. There was no significant difference in gender of metastatic and reactive lymph node groups (P = 0.075). Moreover, there was no significant difference in patients’ age between two groups (P=0.721). Most patients had hypopharyngeal SCC (22%) followed by oropharyngeal (19%) and tongue (19%) cancers (Table 1). According to pathology reports, the number of metastatic lymph nodes was 47, while the remaining 16 were reactive. Thirty-three lymph nodes were round and the others were oval. Mean minimum and maximum diameter of the lymph nodes were 21.11 mm and 34.03 mm, respectively. Circulation pattern of 41 lymph nodes was peripheral and the others had central (15 lymph nodes) or mixed (7 lymph nodes) circulation. Mean systolic velocity, RI and PI of lymph nodes were 19.51, 0.75 and 1.67, respectively. There was a significant difference in some features of lymph nodes such as length, width, RI, PI and systolic velocity between metastatic and reactive lymph nodes (Table 2). Cut-off levels for different features of lymph nodes were calculated using ROC analysis to distinguish metastatic lymph nodes from reactive types as shown in Table 3. Mean length diameter of metastatic lymph nodes was 34.98 mm, while reactive lymph nodes had a 31.25 mm mean length diameter (P = 0.037) and mean width diameter of these two groups were 22.62 mm versus 16.63 mm, respectively (P = 0.001). The cut-off level for length or maximal diameter of lymph nodes was 33.5 mm and this level for width or minimal diameter of lymph nodes was 18.5 mm. Using these levels, the sensitivity, specificity, positive predictive value (PPV) and negative predictive value (NPV) of metastatic lymph nodes length were 59%, 68%, 84% and 36%, respectively and these measures for width of metastatic lymph nodes were 63%, 75%, 88% and 41%. The sensitivity, specificity and accuracy for oval shaped metastatic lymph nodes were 63%, 68% and 64% (Table 4). Mean systolic velocity, RI and PI of metastatic lymph nodes were 21.23, 0.79 and 1.83; while these measures were 14.44, 0.64 and 1.18 in reactive lymph nodes (P < 0.001) (Table 2). The cut-off level for RI, PI and systolic velocity were 0.695, 1.35 and 16.5 using ROC analysis (Table 3). The AUC for characteristics of lymph nodes were 0.668 for length (95%CI: 0.517 - 0.818, P value = 0.047), 0.723 for width (95 % CI: 0.593 - 0.854, P value = 0.008) and 0.858 for systolic velocity (95 % CI: 0.761 - 0.956, P value = < 0.001) (Figure 4). The diagnostic accuracy of these cut points is shown in Table 4. According to the results, the most valuable feature for determining a lymph node as metastatic is circulation pattern and it has the highest accuracy (89%) among all lymph node features previously mentioned. Sensitivity, specificity, PPV and NPV of peripheral circulation pattern were 85%, 93%, 97% and 86%, respectively. Exact regional distributions of detected lymph nodes were not specified for every patient. They were mostly distributed along the sternocleidomastoid instead of sternocleidomastoid muscles bilaterally, which corresponds to the zones II, III and IV. Zone I including submental and submandibular regions was less equally involved and there was no obvious involvement of zone V and supraclavicular nodes. SCC tumors constitute most of head and neck malignancies, which are roughly 5% of all carcinomas (20, 21). They are common cause of neck lymph nodes swelling and differentiating involved nodes from benign ones is still a real challenge (22). The efficacy of sonography for evaluation of neck lymph nodes has been shown by numerous researchers (16, 23, 24). The role of both gray scale and color Doppler techniques for differentiating benign lymph nodes from metastatic ones by evaluating internal and external sonographic features is well established (25-28). However, no accurate criteria for differentiating metastatic lymph nodes from benign ones are yet determined (24). In the present study, gray-scale sonographic features such as minimal and maximal diameters and shape as well as color Doppler features including circulation pattern, RI, PI and systolic velocity were evaluated. In the current study, a significant difference between vascular pattern of metastatic SCC and benign lymph nodes was found. The sensitivity of vascular pattern was 85% for differentiating metastatic SCC lymph nodes from benign ones in the present study. Most studies reported sensitivity of this feature from 78% to 96% similar to the result of this study (5, 16, 17, 29-33). The specificity of this feature in the present study was 93%, which was in concordance with the results of some other studies reporting specificity from 91% to 100% (5, 29-32). In a study on cervical lymphadenopathy in patients with oral SCC, sensitivity and specificity of circulation pattern were 91% and 92%, respectively (27). The high specificity of vascular pattern in differentiating malignant lymph nodes from benign ones is due to the low prevalence of peripheral vascularity in reactive nodes. Another study reported lower specificity as they categorized inflammatory nodes such as tuberculosis in reactive nodes group (16, 17, 33). The vascular pattern of tuberculosis simulates both benign and metastatic patterns and is peripheral in 31% of nodes (34). Five metastatic lymph nodes in the current study depicted central vascularity. This is possibly because the vascular pattern of metastatic nodes could be central in early stages in response to increased local immune reactions (32). According to our results, RI and PI were significantly lower in reactive nodes compared to metastatic nodes. This result was in agreement with the results of some other studies (35-38). The increase in RI and PI of malignant nodes could be justified by the theory that cell production in metastatic nodes could increase the pressure on internal structures such as vessels and consequently increase their RI and PI (35). On the contrary, Adibelli et al. could not find a significant difference in RI and PI between these two groups (39). In the present study, the most suitable borderline value of RI in differentiating metastatic from reactive lymph nodes was 0.69 with sensitivity and specificity of 82% and 81%. Ying et al. also reported similar cut-points (0.7) with sensitivity of 88% and specificity of 78% (5). However, Steinkamp et al. reported 0.8 as the optimum borderline value with sensitivity of 80% and specificity of 94% (38) Moreover, cut-point of 1.35 was calculated as the optimum PI for differentiating reactive from metastatic nodes with sensitivity and specificity of 82% and 68%, respectively. Although, a similar result was reported by Ying et al. (cut-point = 1.4) with sensitivity and specificity of 82% and 92%, Steinkamp et al. mentioned 1.6 as the cut-point with sensitivity of 94% and specificity of 97%, respectively (5, 38). According to the present study, there was no significant difference in average maximum diameters between metastatic SCC and reactive nodes. This is in concordance with the results of Takeuchi et al. study; however, some other studies reported the reverse (24). A marked difference in short diameter between the two groups was found, which was in concordance with the results of some other studies (20, 40-42). Sumi et al. investigated SCCs of head and neck and reported a significant difference in short diameter of benign and metastatic nodes (40). The cut-off level for short axis in the current study was 18.5 mm with 63% sensitivity and 75% specificity. Previous studies reported cut-off levels from 5 to 10 mm and this difference is because we evaluated only the largest palpable lymph node in every patient (12, 43-45). According to the previous studies, nodal shape is a valuable parameter in differentiating malignant and metastatic nodes from benign ones (13, 35, 46) Malignant and metastatic nodes tend to be round, and benign nodes are mostly oval (14, 47, 48). In accordance with recent reports, a significant difference in shape was found between metastatic and reactive nodes in the present study (P = 0.023). In the current study, sensitivity and specificity of this parameter were 63% and 68%, which is different from the results of Mazaher et al. (6) (80.7% and 78.1%, respectively) and Imani Moghaddam et al. (32) (75% and 51%, respectively) studies. Various results can be due to probable differences in nodes regions as Ying et al. reported that 95% of normal submandibular and 59% of normal parotid lymph nodes could be round (5). We did not compute intra-observer reliability in the present study and it could be considered in future studies. In conclusion, gray scale sonography in combination with Doppler sonography could be a trustworthy technique in differentiating metastatic SCC lymph nodes from reactive ones. Although, circulation pattern had a higher diagnostic accuracy in the present study, combination of sonographic characteristics could be more beneficial in differentiating metastatic SCC cervical nodes from reactive ones. We thank pathology as well as surgery departments of Hazrat Rasoul Akram Hospital for their kind assistance. Authors’ Contribution: Study concept and design: Mahyar Ghafoori and Amin Azizian. Analysis and interpretation of data: Mahyar Ghafoori, Amin Azizian and Zahra Pourrajabi. Drafting the manuscript: Hamed Vaseghi, Mahyar Ghafoori, Amin Azizian and Zahra Pourrajabi. Critical revision of the manuscript for important intellectual content: Mahyar Ghafoori and Amin Azizian. Data Analysis: Hamed Vaseghi and Zahra Pourrajabi. Funding/Support: This study was supported by Tehran University of Medical Sciences, Tehran, Iran.